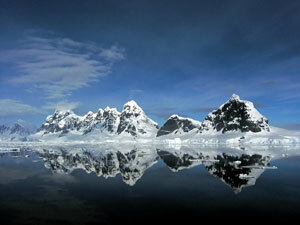 Antarctica is an increasingly popular travel destination. The area is so remote that it may seem surprising that visitors go there. But that very remoteness is what they are seeking. They come to be awed by the snowy ice caps, beautiful and rugged terrain, and abundance of arctic animals. 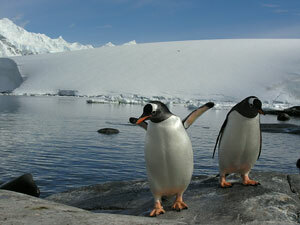 Most Antarctic visitors arrive on cruise ships. The ships may stop at some of the outlying islands or on the peninsula that juts out towards South America. It is for that reason that most ships to Antarctica leave from Ushuaia, Argentina (the southernmost city). Antarctic cruises go to various locations but generally destinations are limited to the Antarctic Peninsula and the Shetland Islands. The peninsula is the only stop that is truly part of Antarctica's mainland. Cruises to the Antarctic Peninsula will often pass through the Antarctic Circle so that passengers can say they "have been to the South Pole." Along the peninsula lies the Lemaire Channel, known for its sheer cliffs that drop straight into the sea. On one side is the Antarctic Peninsula; on the other side is Booth Island. At the southern end of the channel there is an archipelago of gorgeous ice-covered islands. Cruise ships often stop in Paradise Harbor along the peninsula. At this favorite spot, tourists can take small inflatable boats around the area and explore the icebergs, glacier, and blue waters. They may even have the opportunity to get up close and personal with some seals and penguins! The South Shetland Islands are not part of mainland Antarctica. They are a string of islands that run parallel to the coast of the Peninsula. The islands are nearly completely covered in ice, but their coastal areas are home to penguins, seals and seabirds. King George Island — This is the largest of the South Shetland Islands; it features a jagged coastline filled with fjords and bays. A variety of wildlife lives on King George Island. The island is host to 12 nations that have bases here, making it the unofficial capital of Antarctica. Half Moon Island and Livingston Island — These two islands are great for wildlife viewing. They feature a variety of animals including chinstrap penguins, gentoo penguins, skuas, southern elephant seals and southern fur seals. Whales are often seen offshore. It is a perfect stop for anyone wanting to get a little closer to nature. Deception Island — Deception Island is a very popular destination because visitors can actually go swimming in volcanically heated waters off the coast. In Pendulum Cove, the water is heated by volcanic activity taking place about a mile below the waters inside a collapsed caldera.